Howdy boys! I've gone though my recently bought kit, and by golly, looks like she's pretty well all there. 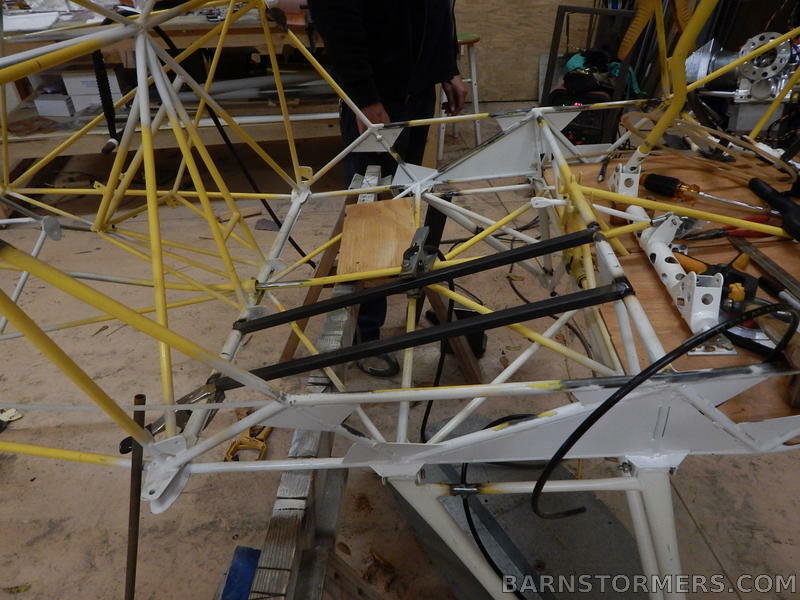 All the chromalloy parts and the fuselage were painted with epoxy chromate primer. There are small amounts of rust coming through in places, no pitting at all. Instead of touching up, I'm gonna take a step back and strip, sandblast and powder coat all. A friend noticed, on Barnstorms, pictures of an uncover kit which showed additional gusseting welded below the cockpit and above the gear. Also bracing was welded in below the seats. Do y'all feel it's nessecary and have any of you guys done the same? I'll want to do these "addons" before I get it coated. And speaking of powder coating, do ya' think there'd be an adhesion issue gluing the fabric to a powder coated surface? 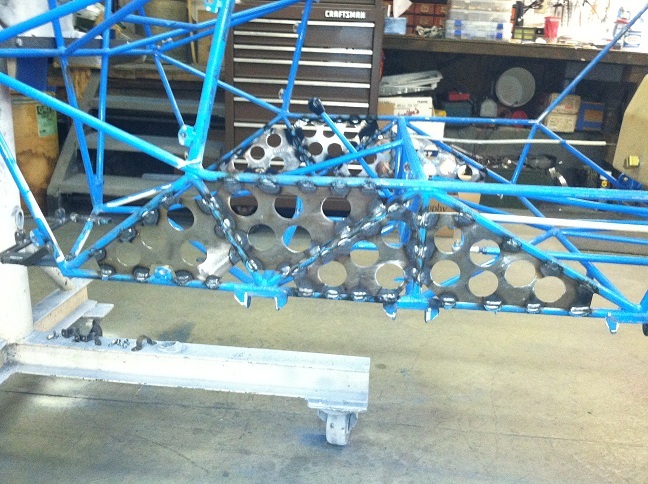 Most everyone thinks that the added gussets are needed on the sides and the gear / seat truss. 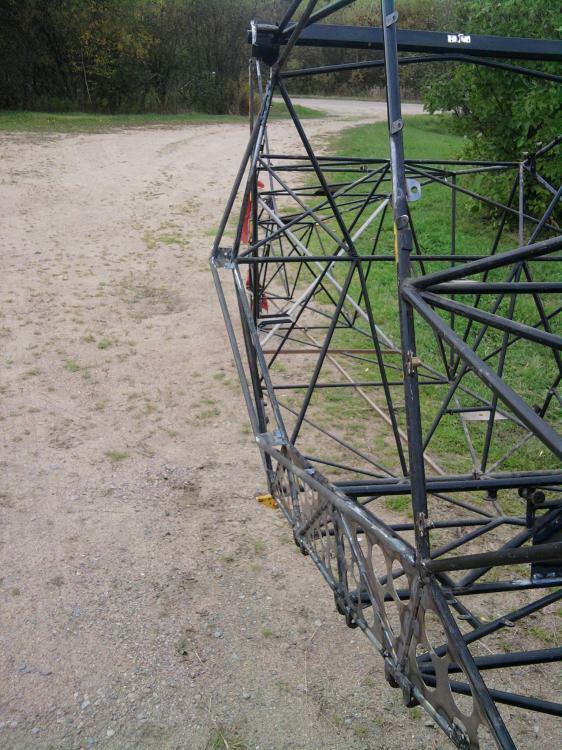 1avidflyer (Jim Chuk) posted some pictures of the bracing in both places, and I believe TJay also posted some. 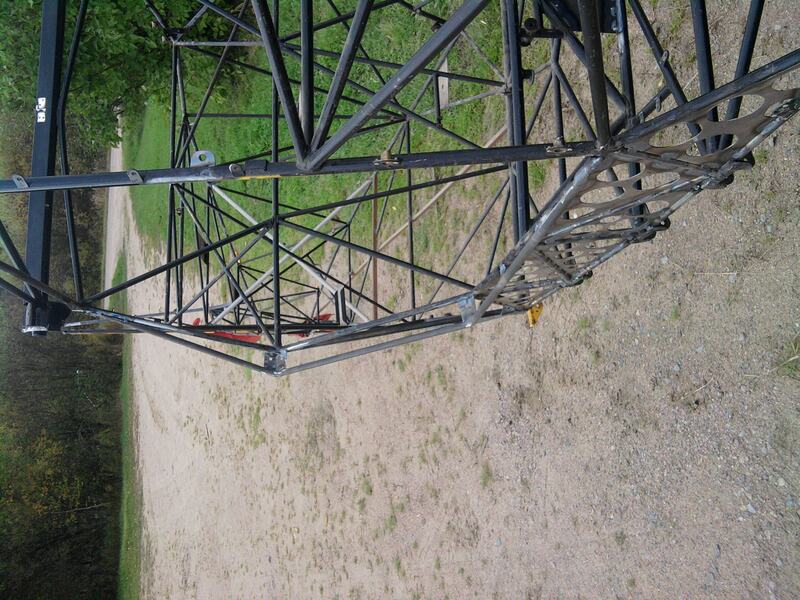 Look at TJay's Kitfox 1 build photos. No problem gluing to powder coating, but epoxy paint is easier remove and to match up if repairs or modifications are needed. That is a builder's choice. Those 2 black painted under the seat tubes will not work to support the seat/gear truss - you need sheet metal under the top cross tube to support the truss. A fiberglass seat will not work with these tubes in the way. Better try fit the seat pan. It won't work with those extra tubes in there. The gussets on the sides won't do you any good unless you are converting to grove gear. Then you want to do them differently. I used an engine stand for working the fuselage and for the wings. A sawhorse on the other end for the wings and a second engine stand for the fuselage. The passenger side rails may be for an adjustable seat frame. Reinforcing the side-to-side under thigh front seat truss is advisable if you ever intend to use bungee style gear (the over limit safety cables can bottom and bend the truss). 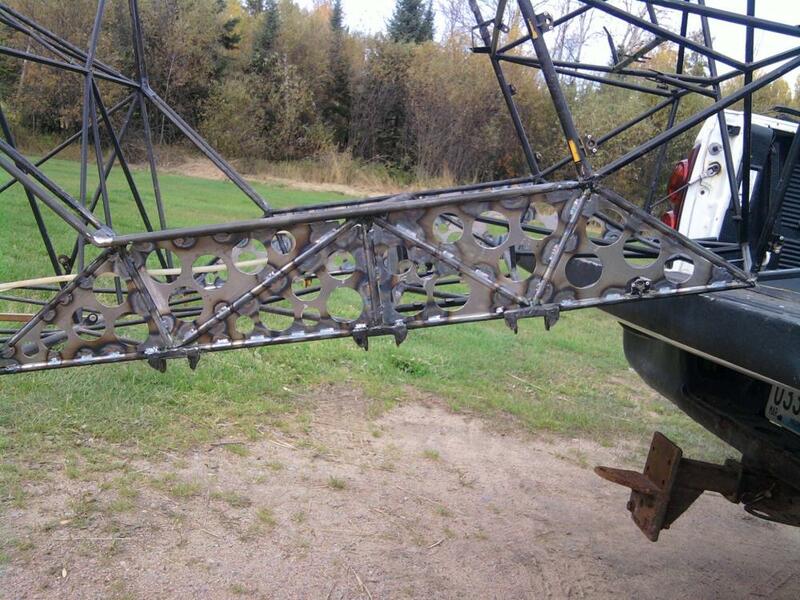 Reinforcing the side longeron trusses is advisable if you ever intend to use Grove style aluminum spring landing gear (excessive front to rear force will cause the relatively narrow gear mounting block to twist the longerons). Well Larry and I have never landed that hard! Ed, the way the gussets are in the above photo, small triangles in the corners only, they will do almost nothing to strengthen the truss. They will act like a knife cutting the tube in the event of an impact causing distortion of the truss. Ed - gussets in whatever place might help save your fuse in hard landing, not so much in a c-r-a-s-h! Agreed, I thought your fuses were crashed parts planes vs. hard landings fix-it projects! Really, the only part of the seat truss that needs a gusset is way inboard, where the bungees wrap around it. After a hard landing with old, weak bungees and too-tight limit cables, I found I had crimped the top tube of the seat truss, so had it cut out and replaced. After this I put in plywood gussets, held in place with interference fit and zip ties, and have not put on new limit cables. The so-called type-1 bungees sold by Aircraft Spruce & Specialty work well, and can withstand a 3-G landing. Make up the ends near max stretch, though. My testing revealed that they could stretch to 200% of their original length and could definitely tolerate 100+ lb forces. With 7 wraps, that's 1400 lbs per side. I was unable to test those bungees to failure with my limited, cobbled-up test rig..
unless you want to eventually bend up your bird, the additional gussets are very highly suggested. especially the fuse sides. This is a known issue that has been solved with the additional gussets. This is double extra triple needed if you decide to use one of the "bush gears" that are currently on the market. I am set up to fab up the first set of the new gear I will be making my next hitch home and will be beating the heck out of it and see how it holds up. Come on, Guys! Nobody ever makes hard landings, do they? I've had the ground jump on me a few times, but never a hard landing! I do on occasion make a simulated carrier landing, you know, just for practice. 2. I can widen the fuselage a little at the cockpit. 3. I'll get the chance to inspect things better. The huge downside is that it'll take a long time to save the money up to do it. The Bush gear will also destroy the side of your plane if you don't do the reinforcements. There was a guy with a Yellow Kitfox one that built his bush gear and did a thread on it getting bent up. Maybe some one out there knows his name. i saw the pics of your build TJay and it looks like you did the same thing. What thickens steel did you use for those gussets? I know your plane is not really a KF1 anymore, more like a KF2++++ but curious what your empty weight is? Also saw your vertical tail extension and haven't gone through all your posts to see if it was stiff enough? I saw a comment about possibly needing to reinforce it. Since I'm going to more than likely be recovering my plane my plan right now is to use some type of wood and square up the tips of the vertical and horizontal stabs and then cover over that. Then at some point in the future do like the Mangy Fox and add larger control surfaces with balance tabs on them. So just wondering if the tail especially the vertical is strong enough for that? I also saw one of your builds where you bonded wood to the side of the cockpit frame to accomplish the same thing, what are the pros and cons? Being a carpenter by trade I'm definitely favoring the wood extensions.